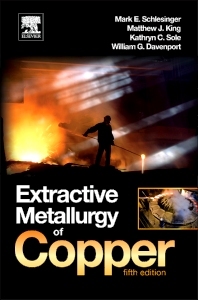 This multi-author new edition revises and updates the classic reference by William G. Davenport et al (winner of, among other awards, the 2003 AIME Mineral Industry Educator of the Year Award "for inspiring students in the pursuit of clarity"), providing fully updated coverage of the copper production process, encompassing topics as diverse as environmental technology for wind and solar energy transmission, treatment of waste by-products, and recycling of electronic scrap for potential alternative technology implementation. The authors examine industrially grounded treatments of process fundamentals and the beneficiation of raw materials, smelting and converting, hydrometallurgical processes, and refining technology for a mine-to-market perspective - from primary and secondary raw materials extraction to shipping of rod or billet to customers. The modern coverage of the work includes bath smelting processes such as Ausmelt and Isasmelt, which have become state-of-the-art in sulfide concentrate smelting and converting. Professor William George Davenport is a graduate of the University of British Columbia and the Royal School of Mines, London. Prior to his academic career he worked with the Linde Division of Union Carbide in Tonawanda, New York. He spent a combined 43 years of teaching at McGill University and the University of Arizona. His Union Carbide days are recounted in the book Iron Blast Furnace, Analysis, Control and Optimization (English, Chinese, Japanese, Russian and Spanish editions). During the early years of his academic career he spent his summers working in many of Noranda Mines Company’s metallurgical plants, which led quickly to the book Extractive Metallurgy of Copper. This book has gone into five English language editions (with several printings) and Chinese, Farsi and Spanish language editions. He also had the good fortune to work in Phelps Dodge’s Playas flash smelter soon after coming to the University of Arizona. This experience contributed to the book Flash Smelting, with two English language editions and a Russian language edition and eventually to the book Sulfuric Acid Manufacture (2006), 2nd edition 2013. In 2013 co-authored Extractive Metallurgy of Nickel, Cobalt and Platinum Group Metals, which took him to all the continents except Antarctica. He and four co-authors are just finishing up the book Rare Earths: Science, Technology, Production and Use, which has taken him around the United States, Canada and France, visiting rare earth mines, smelters, manufacturing plants, laboratories and recycling facilities. Professor Davenport’s teaching has centered on ferrous and non-ferrous extractive metallurgy. He has visited (and continues to visit) about 10 metallurgical plants per year around the world to determine the relationships between theory and industrial practice. He has also taught plant design and economics throughout his career and has found this aspect of his work particularly rewarding. The delight of his life at the university has, however, always been academic advising of students on a one-on-one basis. Professor Davenport is a Fellow (and life member) of the Canadian Institute of Mining, Metallurgy and Petroleum and a twenty-five year member of the (U.S.) Society of Mining, Metallurgy and Exploration. He is recipient of the CIM Alcan Award, the TMS Extractive Metallurgy Lecture Award, the AusIMM Sir George Fisher Award, the AIME Mineral Industry Education Award, the American Mining Hall of Fame Medal of Merit and the SME Milton E. Wadsworth award. In September 2014 he will be honored by the Conference of Metallurgists’ Bill Davenport Honorary Symposium in Vancouver, British Columbia (his home town).